Tyler Johnson was pretty much an unknown when the top American U-20 players gathered in early August for the week-long 2008 USA Hockey National Junior Evaluation Camp in Lake Placid. Of the 53 players originally invited to the camp, Johnson was one of just four draft-eligible players to have not been selected by a NHL team. He had also never played for USA Hockey in any capacity. "I never advanced past regional select camp," he said. Plus, it didn't help his low profile that he played his youth hockey in Spokane, Wash., a non-traditional source for hockey talent, or that he is undersized at 5-foot-9. With all of those marks against him, it would be easy to dismiss Johnson as mere cannon fodder for this collection of America's best and brightest young players. But dismiss Johnson at your own risk. You can doubt his ability to make Team USA for the 2009 World Junior Championship, but just don't tell Johnson. He already has overcome bigger odds than this. Two years ago, Johnson was playing Junior B hockey in the unheralded North Pacific Hockey League. By the time this past June rolled around, though, Johnson was partying with the Memorial Cup, the trophy handed to the champion of the Canadian Hockey League. In 2008, that champion was the Spokane Chiefs of the Western Hockey League, a team that Johnson grew up supporting when Stanley Cup-winning coach Mike Babcock of the Detroit Red Wings was calling the shots behind the Spokane bench. "I watched the team ever since I was little," Johnson said. "My family knew Coach Babcock back in the day really well. It was great, I've always been a fan and I always wanted to play for them and I got my dream." It didn't seem like an achievable dream, though, when the Chiefs waited until the 11th round of 2005 WHL Bantam Draft to select Johnson, an offensively gifted center that was terrorizing opposing defenses, but was considered to be too small for the rough-and-tumble WHL. Johnson has proved naysayers wrong throughout his young career and Spokane was no different. "Yeah, I had to make the team at tryout," Johnson said. "I was kind of skeptical where I was going to play. Probably about fourth line if I would have made it is what they were thinking and I ended up playing third line. I just worked hard." And it paid off in a way that Johnson could have only imagined in his dreams. He took a regular shift for the Chiefs, scored some big goals along the way and raised the Memorial Cup – a trophy second only to the Stanley Cup in its difficulty to win – over his head. "It was unbelievable," Johnson said. "You just dream about coming into that league and winning the Memorial Cup. I got the chance and I did that and got to play every single game and I was a part of the team win. It was just unbelievable. You couldn't ask for more as a rookie. Just unbelievable." Johnson is quickly making the unbelievable become reality on a regular basis. He hopes to do it again by making the World Junior team this winter. He knows he'll only do that, though, by out-working his competition. He's up to the task, he says. Hard work is Johnson's recipe for success. 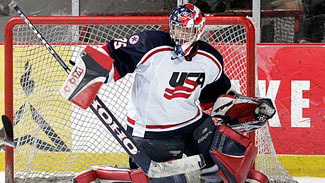 It was the backbone of his pitch in Lake Placid to be included on the short list that will be evaluated this fall before a final decision is made on the USA roster for the 2009 World Junior Championship in Ottawa. Johnson may not have had the pedigree of some of the other players in that Lake Placid camp, but no one topped his work ethic or his enthusiasm. He embraced every opportunity, especially the chance to serve as a penalty killer. In tournament games against U-20 teams from Finland and Sweden, Team USA coach Ron Rolston repeatedly deployed the fleet-footed Johnson to see how he could handle those situations. In fact, Johnson was the primary forward in most of the 5-on-3 situations Johnson's team faced during the four days of games. "For the Chiefs this year I did a lot of PK, so I'm really familiar with it and comfortable with it," Johnson said. "I'll take any ice time I can get." But Johnson is not killing penalties just to get on the ice. He actually enjoys the challenge, not surprising for a player that has overcome challenges at every turn, and excels at it. "I love it. I mean, you play for your team and I don't think your team is going to win if you don't have guys like that," he said. "I do think that is one of my strong points and I try to play that as much as I can." How much does he love it? More than scoring goals, it seems. In one game against Sweden, Johnson scored a pretty power-play goal in a convincing win. Yet, afterward, he just wanted to talk about the successive 5-on-3 penalties he had a part in killing. "I think that (killing a 5-on-3) is better than scoring a goal anyways," he said with a smile. Suffice it to say, Johnson's enthusiasm and skill caught the attention of Rolston and the scouting staff on hand to evaluate the hopefuls. "He had a real good camp," Rolston said. "Tyler's the type of player we felt could come in and be one of those role guys and we could put him in those situations and see how he does. He did a good job. He did good on faceoffs and has a very good stick, especially on defense. He has all those details to his game and that is what we were hoping for and he's done it here." Was it enough to make the final roster for the World Junior Championship? Only time will tell, but it does not seem wise to bet against Johnson.